The turkeys revolted three years ago. Not coincidentally, that was the same year mankind last had Thanksgiving dinner. It\'s now time for you to fight for our ancestral right to turkey roast. Will mankind ever have Thanksgiving dinner again? The turkeys revolted three years ago. Not coincidentally, that was the same year mankind last had Thanksgiving dinner. They had outside help. 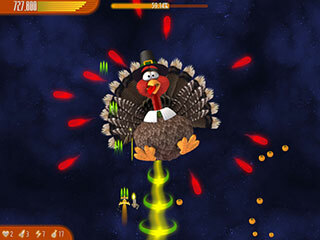 Intergalactic turkeys flocked to the aid of their earthly brethren. They were intelligent, organized, technologically advanced. And they were merciless. It\'s now time for you to fight for our ancestral right to turkey roast. Will mankind ever have Thanksgiving dinner again? Help Weird Helmet find a safe path across the void while scoring as points as possible before his air supply runs out!